Book this enchanting newly-remodeled home is fully-stocked with all the furniture and accommodations of your own place. Conveniently located 3.3 miles from Will Rogers Airport, 2.7 miles from restaurant row on I-240, or 9.6 miles to beautiful downtown Oklahoma City! You can enjoy a night in and cook with new appliances and fully stocked cooking supplies, prepare on beautiful granite countertops, eat in the dining room, get work done in the office area, or sleep in one of the three available bedrooms. Outside features a covered patio overlooking tastefully landscaped garden in the front, and seating out back with real below-ground pool (in season).We take great pride in being accommodating hosts! We can tailor your visit to individuals, crews here for work, families with children, adult get-aways, or larger parties depending on your needs- Inquire NOW to secure your booking: You’re going to love your stay here! If you ask for it, you will get it (within reason) plus Your very own pool surrounded by privacy fenced newly sodded yard!! Enjoy looking out the picture window or memorizing the colors in the custom painted table! 4 smart televisions, 1 for each bedroom and den! 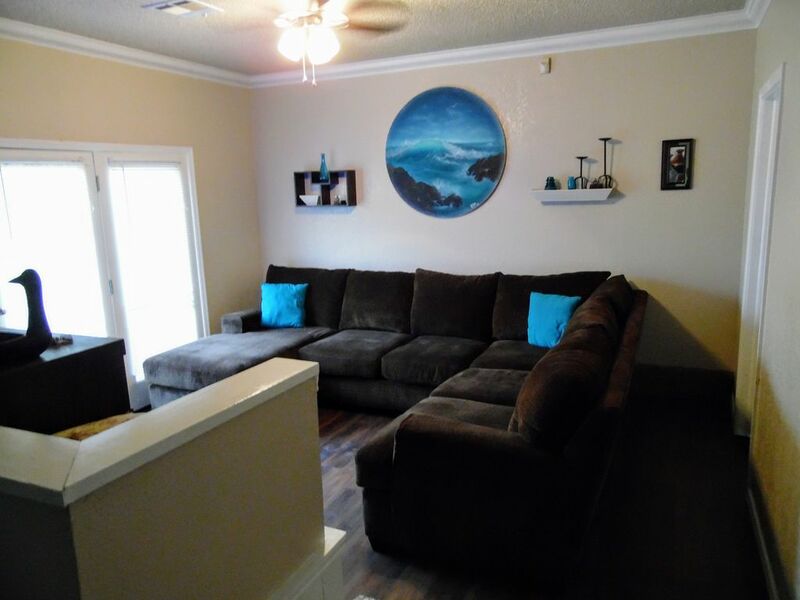 Great location close to the airport and everything you could need is in a short drive!!! Great owners, very clean, nice getaway and close enough to everything OKC has to offer. We only got to stay a few days but definitely wished we could stay longer! Lisa and Chaeton were great hosts and responded fast when we had a small issue with one of the TVs. It's a great place to relax at the pool in between all of our OKC activities. The house was beautiful and very comfortable. We will be staying there again on our next trip! This is our second time staying at this home. It's a really nice home with lots of room. The kids love the pool and I am sure we will be reserving it again in the future. Thank you!